(Mentor, Ohio) – Avery Dennison Graphics Solutions announced today that 14 graphic installers received Avery Dennison Car Wrap Certification in the U.S. and Canada in September and October. The certification is a two-part test that includes a written exam and hands-on vehicle wrap installation demonstration. "The Avery Dennison Graphics Solutions team congratulates these installers on achieving Avery Dennison certification," said Paul Roba, technical manager for Avery Dennison Graphics Solutions. 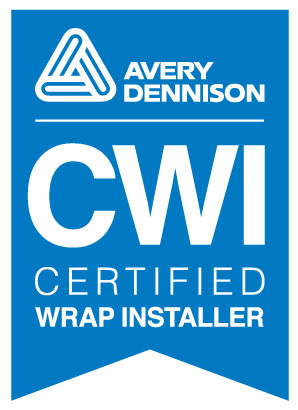 "Avery Dennison Certified Wrap Installers have gone through extensive training and their expertise has been verified. We received unprecedented interest and attendance at the Avery Dennison / Mutoh Car Wrap Trainings and certification in 2012." Shad Interligi, Real Hit Media, Inc.
Cameron Olson, The Graphics Co.
Certified installers receive a free listing on Avery Dennison's www.CarWraps.net directory. Thousands of consumers and small businesses visit CarWraps.net every week to find reputable companies and installers to wrap their vehicles. The Avery Dennison / Mutoh Car Wrap Training classes are taught by Justin Pate, a globally recognized graphic installer. Attendees obtain an in-depth understanding of graphic installation techniques to gain a competitive advantage in the vehicle wrap industry. All classes are taught using Avery Dennison MPI 1005 Supercast Easy Apply RS, a popular choice with installers because it is easy-to-use and quick to install with excellent printability.